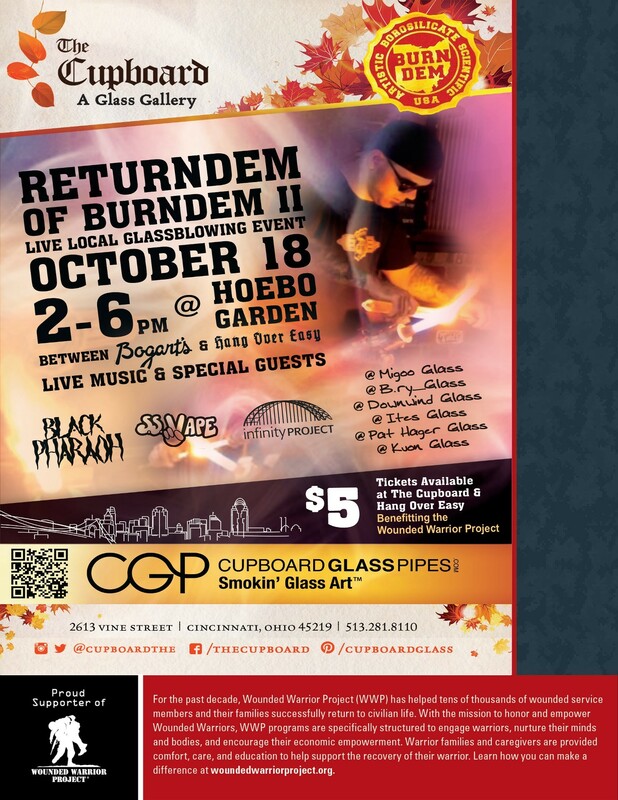 What: The Cupboard's 2nd glassblowing event. This event benefits The Wounded Warrior Project. There will be live glassblowing demonstrations, live music, and special guest SS Vape. items to auction off, and more! All ages permitted. $5 admission. Who: Glassblowers show you their talents live! This year we are proud to have: Migoo, B.ry_Glass, Ites Glass, Pat Hager Glass, Kvon Glass, and Downwind Glass. Live music from Black Pharaoh and The Infinity Project. Tickets are $5 and can be purchased at The Cupboard, Hangover Easy, or at Bogarts. Alternatively, you can donate $5 (per person) or more to The Wounded Warrior Project and bring your receipt for admission. Go to CupboardGlassPipes.com/benefit to donate.